2017 Poll Deal Revealed - Will Odinga Run for Presidency Again? President Uhuru Kenyatta (centre), Deputy President William Ruto (left) and opposition leader Raila Odinga after Ruto hosted them for lunch at his Karen residence in Nairobi County on November 2. His travels across the continent will be in line with responsibilities that include building political buy-in and ownership of member states, mobilising Africa's partners and resources to assist member states and facilitating member states to review and conform to recommendations on the Minimum Road/Highway Design of the Trans African Highway Network. To provide the required leadership in this critical area, and in line with his previous pronouncements, Mr Odinga wishes to reiterate that he will not engage in Kenya's succession politics ahead of 2022. 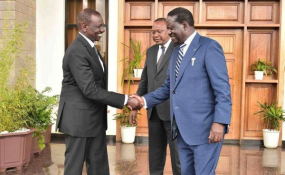 While in Siaya County on Saturday, however, Mr Odinga indicated that he will continue to engage in local politics despite his new diplomatic job. He assured his supporters that his new role will not alienate him from them. "I am going nowhere. My new appointment as AU envoy comes with an office in Nairobi, Kenya. I will just be travelling to Ethiopia, South Africa, among other African nations, on assignment and returning to the office in Nairobi, where I will be based," he said.